Researchers at the Advanced Digital Sciences Center specializing in computer vision technologies are developing an intuitive, reliable and fast solution for identifying and retrieving relevant information about pill medications. Applications for the pill identification technology include use in hospital and nursing home pill packing machines, as well as a mobile device for patients, specifically the elderly, to ensure the right pills are being taken each day. 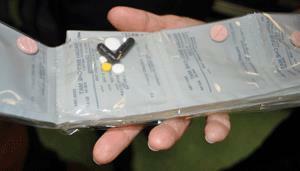 Many of today's hospitals currently have pill packing machines, which automatically package the pills for each patient. Some of these machines include quality control modules to check for physical defects of pills, gaps in package seal, correct and readable labels and quantity errors, using technology such as barcodes and radio-frequency identification (RFID). However, in many machines, these techniques are inaccurate or outdated, often leading to time-consuming manual quality control. ADSC's pill identification research is led by Gang Wang, a research scientist at ADSC and University of Illinois at Urbana-Champaign computer science graduate. It was inspired by a conversation about personal pill containers between ADSC Director Marianne Winslett and ADSC research scientist Jiangbo Lu, who helped initiate the research. According to Wang, ADSC's technology works directly on pill images using image processing and computer vision techniques. First, given an input image, the pill part is automatically separated from the background. Then different techniques are applied to detect and represent key visual features of the pill, including major colors, shape and imprint. Finally, a two-step image matching approach is performed to retrieve the top matched pills from an online image database, based on the similarity of visual features. Wang and his team have been collaborating with Singapore's National University Hospital to develop a final product in a testing lab. Wang is using the algorithm created at ADSC to complement the current pill packing machines the hospital already has. The hospital's machines have been programmed with the new algorithm, so the machines are able to automatically detect anything incorrect in the packing. In developing the algorithm, Wang and his team faced many challenges, such as low quality images of pills, due to reflections on bag surface, and pills with similar shapes, textures or colors. Additionally, when there are multiple pills in a bag, some may be occluded or identical pills may have different orientations. "We have addressed the imaging and orientation issues, but we are still working on how to tell small differences between the pills, or the verification accuracy," Wang said. Ideally, the team believes that every hospital in the world would benefit from this technology. In addition, they plan to also push the mobile version of their pill identification technology, as it will most benefit the aging population. "Aging has become a very big problem, so we're seeing more and more senior citizens staying home without other relatives or healthcare providers," Wang said. "They have to take care of themselves and often have to take a lot of pills every day. Our staff can integrate our algorithm with the proper hardware and we can help them make sure they take the right pills each day." Wang and his team plan to commercialize the application for use in hospitals to complement pill packaging machines in the near future. They are also looking to create a prototype this summer and expect to integrate the algorithm with the hardware later in 2012. The Advanced Digital Sciences Center is a Singapore-based research center for faculty of the College of Engineering at the University of Illinois at Urbana-Champaign. ADSC focuses on breakthrough innovations in information technology.